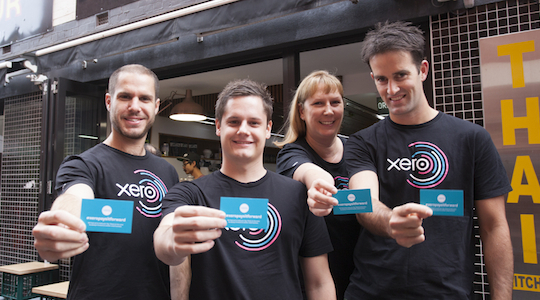 Accounting software company Xero is attempting to kickstart International Pay it Forward Day in Australia today in a PR campaign supporting local charity, Youth Off The Streets. Xero staff have been visiting small businesses around the country performing random acts of kindness for unsuspecting strangers. This year, International Pay it Forward Day aims to inspire more than three million acts of kindness around the world. In this piece of video content, Xero pays it forward to people in local businesses including Surry Hills’ The Stables and South Melbourne’s St Ali cafes, Bondi Icebergs swimming club and Melbourne mexican restaurant Fonda. “We’ve asked staff to nominate a business if they’re willing to put money forward, and we’re matching that dollar for dollar for a great charity which is Youth Off The Streets,” Chris Ridd, Xero Australia managing director explains.